Lord it was cold (again) today and even though the weather report for New York promises that the temperatures will climb into the 40s and 50s later this week; I just don’t think I can rely on Mother Nature anymore. She has been such a tease – first promising spring with sweet nothings and sunshine, then whirling away in a flurry of snowflakes and stinging winds. Not cool. Not cool at all. How, you might be asking, do I intend to do this? 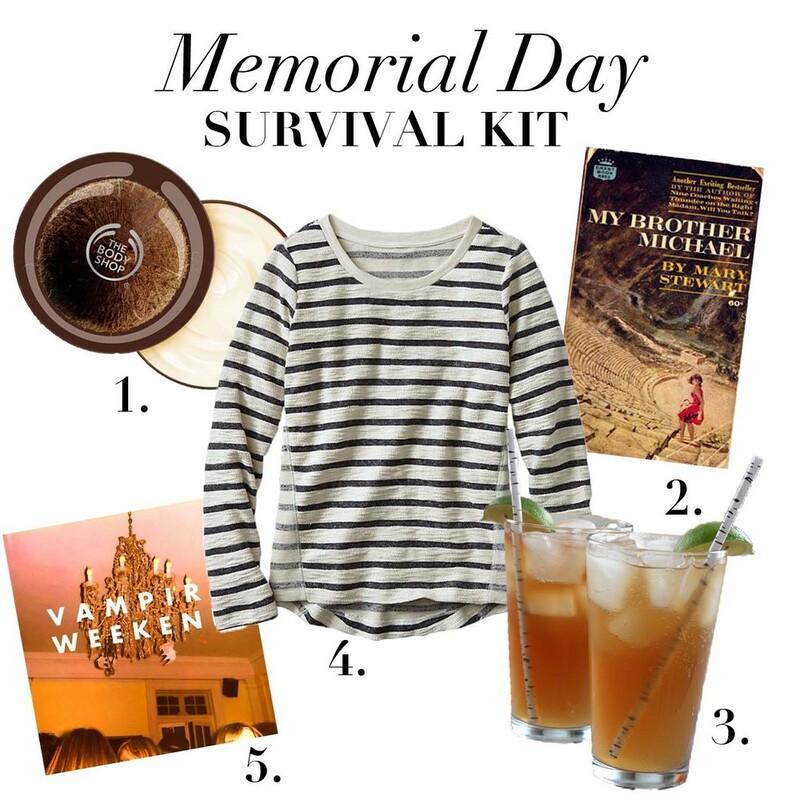 Like so, with my handy make it to “Memorial Day” survival kit. Let’s engage the senses and pretend it’s late May, shall we? 1. Smell: The scent of sunscreen always makes me think of long afternoons on the beach. The Body Shop has given us the coconut for the times we don’t need the SPF. 2. Sight: Mary Stewart’s descriptions of a young woman’s adventures in 1960s Greece in My Brother Michael are fantastic – mini vacation! 3. Taste: Dark & Stormys are the official drink of Bermuda. Spicy, summery, and super easy to make. Just mix Goslings dark rum, ginger beer, lime, and ice to your taste. Done and done. 4. Touch: It’s too cold for a long sleeved tee, but Memorial Day wouldn’t be complete without navy sailor stripes, so while it’s still chilly I’m thinking a nautical sweatshirt is in order. 5. Sound: When I need a warm weather soundtrack I turn to Vampire Weekend's eponymous first album. Road trip to the shore with the windows down and the volume up.